The author is reminded that when women come together to stand up for their rights and freedoms, they are a powerful, hopeful force. In the middle of a quadrangle of old brick buildings, I stand next to my closest friends as we line up for our college graduation. I’ve been dreading this day. It feels exactly like the last day of summer camp: packing, tears, hugs and not knowing when we will see each other again. As we pose for our parents’ photos, we lean into each other, arms around waists; our young faces look right into the cameras. We wonder if we’ll ever feel this hopeful and empowered again. I love Smith College. I mean, I loved going to school there, but I also love the place itself. The walking paths that wind through the campus; Neilson Library with its armchairs I napped in so often when I was supposed to be studying; Paradise Pond, which had been my backyard since the day I moved into my first room on my first day. Smith was like no place I had ever been before, and more importantly, like no place I had ever lived before. It was my first taste of freedom as a young adult. I was free to be myself, to do what I wanted when I wanted and to be who I really was. Walking anywhere on campus, I felt protected by the other 2,500 women who would have my back if anything were to happen to me. Being surrounded by support and by political discourse in a community of women was something I reveled in at Smith, and I missed it after graduation. 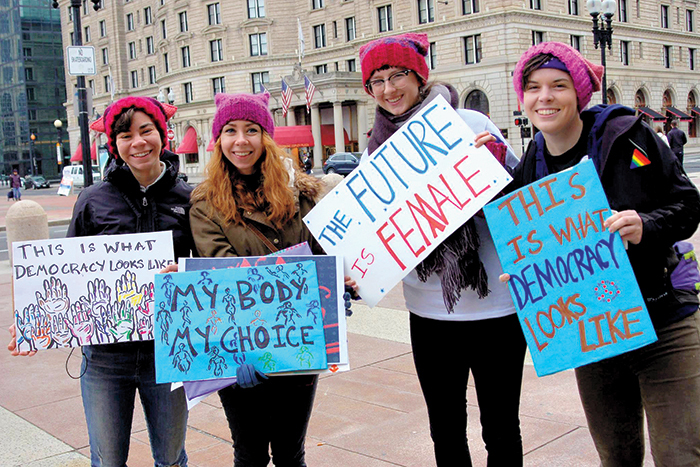 It wasn’t until this past January, when I participated in the Boston Women’s March for America, that I felt something resembling that kind of community in my post-college life. As I stood on Boston Common on that cold, sunny January day, I was surrounded by thousands of women who were strangers to me, but who felt like a unified group. We were all there to be heard and to listen to one another. We were there because the lives of girls and women are vitally important to us. Everyone was kind and courteous. I had that same warm Smith feeling of being respected, being supported and being lifted up by a community of women. Looking at all the women with clever political signs and a sea of pink hats brought me back to my first Smith Convocation, when I encountered a community of bold, loud, creative women who would shape my adult life. From that lively evening in John M. Greene Hall to the diploma circle in the Quad four years later, I was surrounded by women who cared deeply. We cared about knowing each other’s stories, learning each other’s perspectives and figuring out where we, as women, fit into the world. Those Smith women whose arms were entwined around me on graduation day: I had lived and breathed them for four years. In those years, I became an adult, and a woman who felt supported enough and safe enough to tell the truth about herself. The photos of me in cap and gown with my best Smith friends are packed away in a silver photo album now, but the politically engaged woman I became at Smith is very much with me. Being a part of the march in Boston—as in marches around the world—reminded me that when women come together to stand up for their rights and freedoms, we are a powerful, hopeful force. Madeleine Schulman ’93 is a freelance writer.